Porsche is adding to the range of options available on its Panamera four-door luxury sports saloon with a power upgrade kit for the Panamera Turbo and a new styling package. This means that from September, buyers will be able to choose a new Powerkit, which raises the Turbo's engine output by 40bhp to an immense 540bhp. 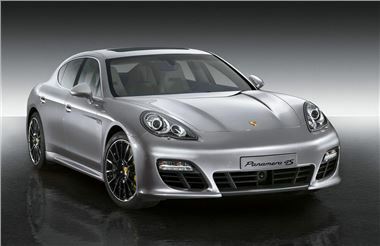 Key elements of the Panamera Turbo Powerkit are two new turbochargers with titanium-alloy turbine wheels. The engine management computer has been adapted and the result is a further improvement in the engine's responsiveness. Maximum torque rises to 750Nm from 700Nm and when the Sport Chrono package is combined with the Powerkit, torque increases in the over-boost mode to 800Nm. In Sport Plus mode, the Panamera Turbo with Powerkit accelerates 0.1 sec faster than the standard car, reaching 62mph from rest in just 3.9 sec. Top speed is 190mph compared with 188mph, although at that speed, few people will be worried about the extra 2mph. However, by returning 24.6 mpg, fuel consumption of a Panamera Turbo with Powerkit is the same as that of the 500bhp version. As a Porsche Exclusive option, the Powerkit will be available from September 2010 at a price of £11,118 including VAT. Porsche Tequipment will launch the Powerkit as a retrofit kit from November. Then there's the Sport Design Package, while new 20-inch Panamera Sport alloy wheels and the Porsche Torque Vectoring Plus (PTV) system have also been introduced as options. The Sport Design Package includes a unique, body-coloured nose with wider black air intake grilles, separate side skirts and the standard, body-coloured rear underbody apron with diffuser and fins. Starting from October 2010, the Sport Design Package will be available from Porsche Exclusive for £2516 including VAT, or for retro-fitting from Porsche Tequipment. 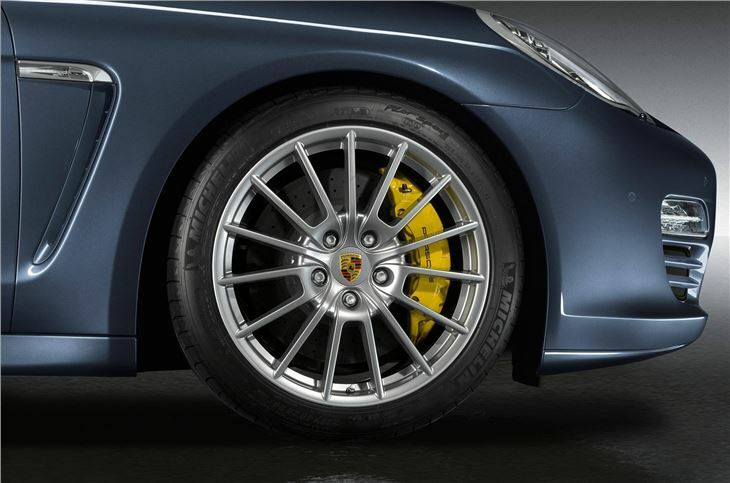 The new 20-inch Panamera Sport alloy wheels are a light alloy multi-spoke design. They are 9.5" wider on the front, and 11.5" wider on the rear. Consequently they sit flush with the wheel arch for a distinctive look. The wheels are available from Porsche Exclusive in GT silver metallic, black, or co-ordinated with the body colour from £2247 including VAT (£1,058 on Turbo models). The wheels are available in GT silver metallic and black for retro-fitting from Porsche Tequipment. Inside the cabin, a three-spoke sports steering wheel with gearshift paddles is also available as an option in combination with the Porsche Doppelkupplungsgetriebe PDK gearbox, priced at £277. But for those who want to increase the chassis agility of the V8-engined Panamera, there is a Porsche Torque Vectoring Plus (PTV Plus) option together with Porsche Dynamic Chassis Control (PDCC) and a fully controlled rear axle differential lock. Costing £3,130, PTV Plus optimises steering behaviour by intervening in the brakes on the inner rear wheel in a bend to generate additional rotational force acting in the same direction as the steering wheel. The result is even more direct and dynamic steering response when cornering - and at the same time PTV Plus, in conjunction with the rear axle differential, improves traction on the rear wheels when accelerating out of a bend.